What on Earth is Supermarionation? It’s funny because Gerry Anderson throws around that term as if it is a way of filmmaking such as Cinemascope. Though, I suppose that is exactly what it is! Instead of filming television series using boring old wooden human actors, Gerry Anderson chose to create television series using wooden marionettes. OK, maybe not so wooden. The thing is that it is more than filmmaking; it is truly an art form. The first Supermarionation program was in 1960 with a program call Four Feather Falls and by the time we get to The Secret Service in 1969, the Supermarionation process was quite refined. The original supermarionated (if that is even a word) figure is, to me, was almost grotesque and creepy. They have big bulge eyes and over exaggerated features. The general reason for this is that the apparatus in the head that automatically opens the figure’s mouth to sync up with the pre-recorded dialogue was in its infancy and was quite large. By the time Gerry Anderson, or more accurately Century 21 productions, made The Secret Service the apparatus in the marionettes head was small enough to make the head be in scale with the rest of the body. This is one of the things which make watching The Secret Service so appealing is the miniatures of the cast and sets with all of its minute detail. This DVD set has been in my library for some time but I never really got around to watching it. So as this was pulled from the mysterious envelope as the program I would be watching this week, I decided to look at the first two episodes. 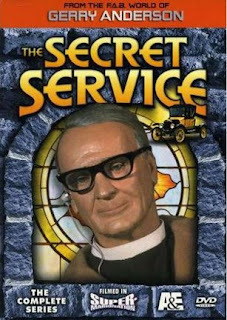 Basically, this is what the Secret Service is about: the series followed the adventures of Father Stanley Unwin, a priest who moonlights as a secret agent for an organization called B.I.S.H.O.P. (British Intelligence Service Headquarters, Operation Priest). Answering to a man known as "The Bishop", Unwin is partnered with Matthew Harding, who works as his gardener as cover for his espionage work (Wikipedia.2007). The first episode is about the the Healy KX20 mini computer being stolen from the UK government by Dreisenberg agents. Father Unwin is called into action to get it back with the help of Mathew. To be honest, this was a disapointing first episode for me. One of the hallmarks of a Gerry Anderson series is that sometimes when a character needs to switch a light on or is trying to open a door, we will see a shot of a real hand up close doing those things. As my wife and I call it, a “Real Hand Alert” because it is so intrusive to what we were just watching. It’s actually kind of charming and I understand the reasons for doing it. In the case of this episode of The Secret Service, this use of real people for certain shots go well beyond just a hand on the screen. I would say about 20% of the episode was real people walking around, lots of close ups of hands, and real buildings. Real cars drive up and down real streets as well as real airplanes are in the…er…..real air. My thought, as I was watching it, was why bother with the marionettes? You might as well just make a TV series with live action people. Well, Gerry did do just that later that year with UFO but that’s another story. The plot for this episode was uneventful and was not as interesting as I had hoped. I was not interest in what the Dreisenberg agents stole and by the time they were trying to escape, I was hoping they would just so the episode would end. As that episode ended, I was a little concerned about watching the second one. Rule #1 in a Gerry Anderson production: if there is a cool looking model of an airplane, building or whatever, you should expect it to blow up with a lot of flames. Derek Meddings who had been responsible for all the minature buildings and special effects since the earliest of Gerry Anderson productions, had a staff who build some incredible miniatures. With each series they would get better and more detailed. This episode starts off with a shot of a British-designed desalination plant that explodes after 250 hours of operation. Is it a faulty design or is it sabotage? Father Unwin is brought in to figure out what is going on. It is clear that these episodes follow a certain structure. Part of this structure is that Father Unwin needs to rendezvous with Mathew at some point in the episode but ends up getting delayed by someone trying to talk with the priest. In the first episode it was a policeman and in the second it is someone who liked Unwin’s car. The Father then starts speaking in gibberish to confuse the person he is talking with to the point where the other person just gives up. This is known as Unwinese. Father Unwin was played or rather voiced by Comedian Stanley Unwin. Part of his act was this form of speaking which is called Unwinese. Apparently, it was popular when he did it; it annoyed me. It also annoyed Lew Grade from ITC who thought Unwin’s language would not work for American audiences to whom he was trying to sell the program. Grade cancelled it. Only 13 episodes were made of The Secret Service. I personally found the second episode to be much better than the first. As with most of the Supermarionation series I have seen, there is not a defined first episode in terms of introductions of character, situation or anything like that. You could generally run the fifteenth episode in place of the first and no one would who had not seen the program before would be the wiser. Therefore, I think this episode would have been a better first episode. To start with, there is more Supermarionation and less shots of live action people. Also, the plot is more interesting and has some fun plot devices. For example, an agent is sent to the desalination plant just as a device in Father Unwin’s plan to allow the Father access to the plant without blowing his cover. It’s ingenious, far-fetched, and fun all at the same time. Actually, I think that sums up Supermarionation perfectly. I viewed these episodes from the A&E NTSC R1 DVD set that was released in 2003. I personally have enjoyed the quality of the all of the Gerry Anderson releases. The film looks in good condition and the sound is crisp. I know that The Thunderbirds have been released on Blue-Ray in the UK but I am not on the HD bandwagon yet. I have an HD TV but do not plan to get Blue-Ray for some time. Next week: Frankenstein (1931) Universal. Sourced from the Legacy Collection DVD set.